There can’t be many universities around the world where an occupying army has built a firing range on campus. But that is the reality for Palestine Technical University in the West Bank. Since October, the Tulkarm campus has been under repeated attack by Israeli forces, with student demonstrations suppressed by rubber-coated metal bullets, tear gas – and even live ammunition. In an approximately six week period, 350 students were injured by the Israeli army. According to data provided by UN OCHA, Israeli occupation forces injured 726 Palestinians in clashes at the university from October 1 to end of November (including both students and non-students). Of those, 48 were injured by live ammunition, and 126 by rubber-coated metal bullets. 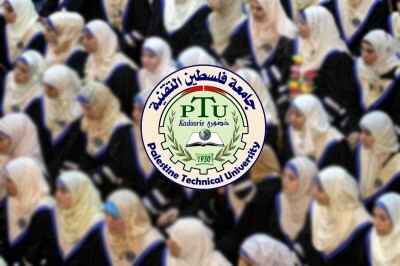 Palestine Technical University – Kadoorie was established in 1930 as an agricultural school, and achieved full university status in 2007. There are approximately 7,000 students enrolled. It is located in the west of Tulkarm, right next to the so-called Green Line separating Israel from the West Bank. The university lost land in 1967, and again later, to the path of the Apartheid Wall. In addition, however, further university land was confiscated by the Israeli military for use as a training area – right next to the experimental greenhouses, and just 200 metres away from the library. On this land, Israeli forces have built a firing range, including “mounds of earth, a winding channel of concrete…and concrete blocks and slabs.” The army has confirmed it has no plans to stop using the range – and has even prevented the university from building a wall to protect students. Over recent months, Israeli forces positioned at the training facility have brutally put down numerous anti-occupation protests. On October 5, Israeli forces closed the university’s main entrance; a few days later, a military bulldozer destroyed part of the university’s wall. On October 8, Israeli forces shot 12 youths with live fire, and 20 with rubber-coated metal bullets; three days later, 18 more were shot. On October 19, three students required hospital treatment when Israeli forces “suppressed a demonstration”. In a video dated November 5, Israeli occupation forces can be clearly seen opening fire from within the heart of the campus. (More videos of clashes can be found here, here, here, andhere. On November 9, Israeli forces “raided the university’s campus library and the engineering department”, with students sent home early for their safety. In this video, dated November 12, a student is chased down by an army jeep, before being punched and kicked by Israeli soldiers. Another video from November 24 shows Israeli forces advancing from their positions, across the campus towards the university buildings. The soldiers repeatedly open fire on protesters (see 5’45, 6’52, 7’18), as well as tossing stun grenades into university premises (6’42). On November 29, dozens of students were injured, with one “taken to the intensive care unit in Nablus.” Last week, seven more Palestinians were shot with live ammunition on one day alone. Numerous images shared by Palestinians on social media show Israeli occupation forcesstorming the campus, including with jeeps, and deploying tear gas. Other photos of Israeli attacks on the campus include from Oct. 19, Oct. 22, Nov. 11, Nov. 23, Nov. 24, Nov. 25, Nov. 26, and Dec. 9. In the above video, students speak about what it is like to study not just under occupation, but with an Israeli army base actually on your campus. Speaking to international activists earlier this month, 21-year-old Nabeha Hasan Ahmad recalled when Israeli forces entered the university. They were shooting live bullets at the students. They started to get inside the university more and more. They threw skunk water on the library. The students who were there were getting hurt by bullets. So many students have had a gun shot. It affects our psychology, we become more afraid when we are doing our exams. We hear the sound of the bullets and we smell the gas. It became normal for our body to smell gas.